Pants, I love them, wear them every day. I lounge in them, work in them, Zumba in them, ski in them, socialize and play in them. But the thought of making them...... gives me the shivers! Pants are so difficult to fit. After putting all the effort into sewing them, will I be lucky enough to have a pair that I actually would wear and be comfortable in? 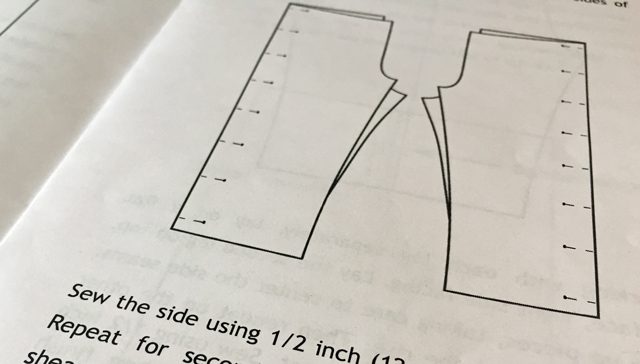 For me, patterns for pants are complicated. There are rises, snaps or buttonholes, waistbands, and pleats or darts, oh my goodness. It's enough to have me turning the page with a sigh and a shrug. But I am not one to give up. I knew there HAD to be a pattern out there that I could understand, complete, comfortably wear, and would actually look flattering on. 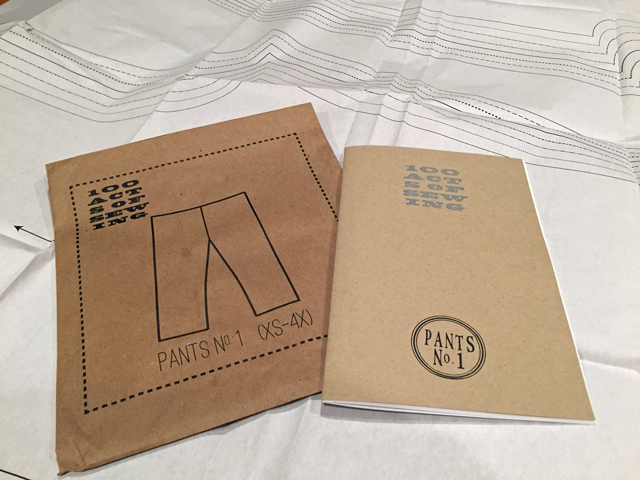 So when I was at Makers' Mercantile and spied the sweet and simplistic packaging of Sonya Philip's 100 Acts of Sewing, Pants No. 1 pattern, I stopped dead in my tracks. I said, "Rhonda, tell me about this pattern". Rhonda went on to explain that it was a very simple, straightforward pattern, and the pants looked very cute on. Just what I had been dreaming of! I purchased it, and went about giving it a go ASAP. First off, look at this packaging. Doesn't it say ~ "These are wonderfully elementary, clear, unfussy, basic pants"? When I looked at the directions, my heart shouted "YES!" I could actually do this. I probably should have made a muslin up first, but I had a feeling that all was going to work out, and besides, I wanted to use jersey fabric, which fits differently than a woven. Normally I use Alabama Chanin's 100% organic cotton jersey fabric, but a friend of mine gave me some of her fabric to try (Thank you, Mary!) The fabric is from Organic Cotton Plus. 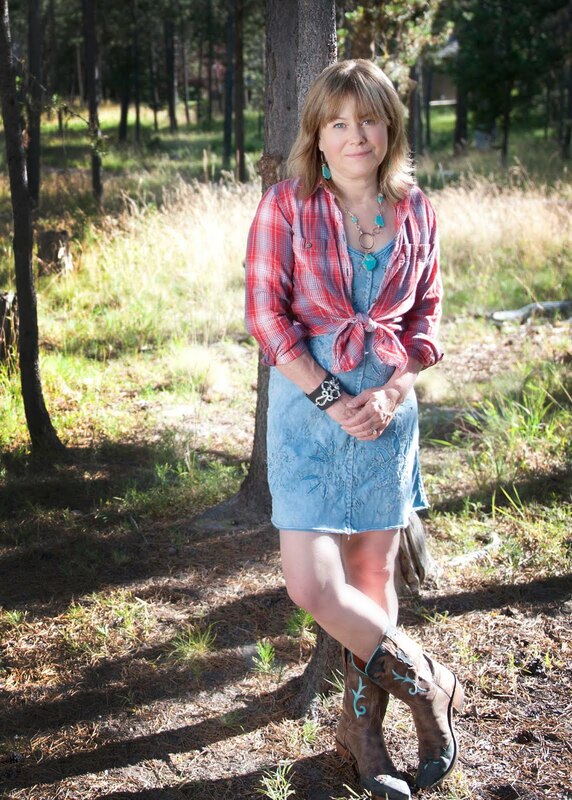 All of their fabric is 100% organic, from the United States and abroad. They are the first fabric retailer in the U.S. to be fully GOTS (Global Organic Textile Standard) certified, which is no small feat. There are 48 companies in the US with the GOTS certification, including Burts Bees Baby and Williams-Sonoma, Inc. I used their domestic baby rib in Shadow Blue. 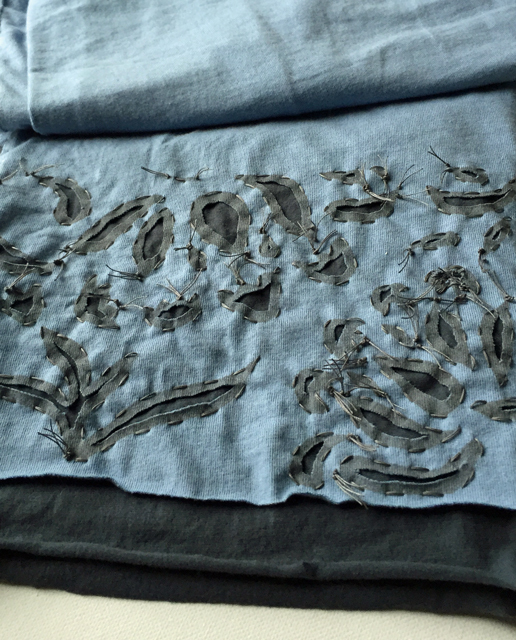 The fabric is not pre-washed, so I ran it through the washer and dryer. 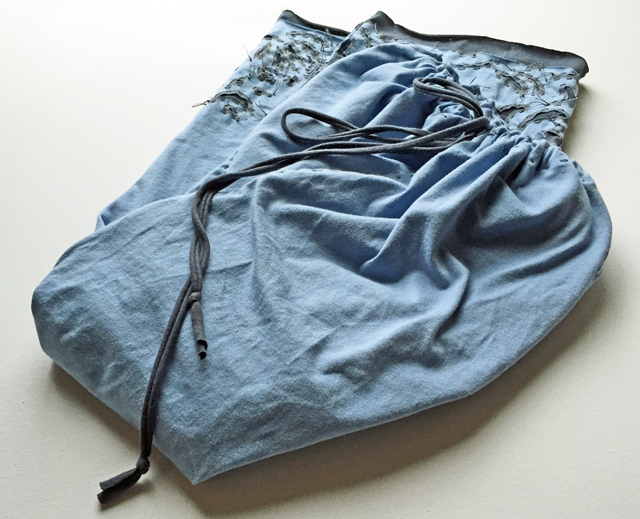 Their selvage was about an inch or so of tighter woven fabric, and it didn't lay completely flat, so I cut it off. 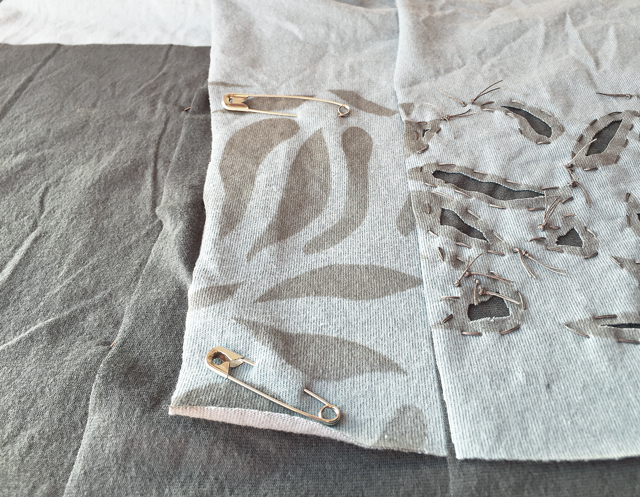 Once the fabric was properly prepped, it handled like a charm. It was easy to work with and laid out nicely. My next step was to copy my size from the pattern onto Pellon. The pattern calls for a 1/2" seam, and I opted for a 1/4" seam. 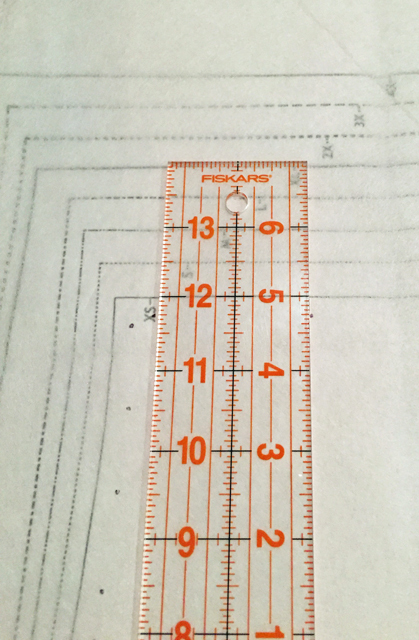 All of the Alabama Chanin patterns use a 1/4" seam. It makes for a less bulky seam when using jersey fabric. I adjusted the pattern accordingly. I was itching to completely embellish the pants, but since I wasn't sure of the fit yet, I decided to make do with a six inch trim at the cuffs. Using the Anna's Garden stencil and Tulip Colorshot in gray, I spray painted the pattern onto the bottom of the pant legs. 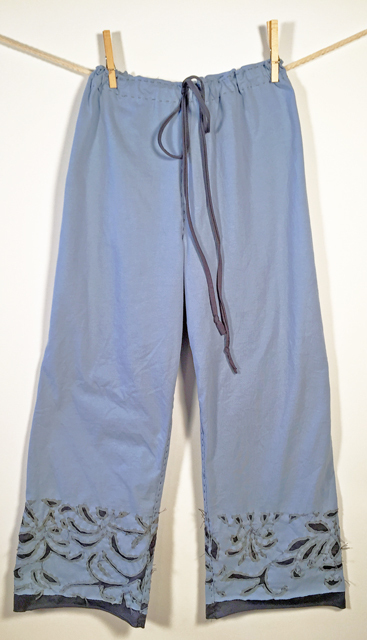 I had some navy lightweight fabric leftover from the Marcy Tilton pants I had made previously. I placed it behind the stenciled area with a one inch "ribbon" peeping out past the very bottom edge. I figured if the pants were too long, I could always cut it off. I'm so glad I did put the extra length on, because now they're perfect. I'm pretty short, so I'd say the pants unaltered are more of a cropped nature. I embellished the trim in the reverse applique method. I then stitched the pieces together, felling all the seams. Since the fabric is jersey, there's no need to finish the seams. I made the waistband, adding a top stitch 1/8" from the very top, and using a draw string instead of elastic. I will definitely make more of these pants. This pair stitched up in less than ten hours, embellishment and all. They fit well and are comfy. They are very roomy, which is great for cozy, lounge wear. I think I'll cut the pattern down by an inch or two in the top half of the pattern to make it just a tad more tailored when I make my fully embellished pair in black on black. See, I'm already thinking ahead! I've been so wanting to make some pants, but was just waiting for the right pattern, and now I've found it. Thank you, Sonya for making this fantastic pattern. I have a feeling I'll be trying even more of your patterns in the future. Very cute. I've been wanting to make a pair of pants AC style. I would love to see you wearing them. Thank you, Elsie. You could definitely make these! They would look cute on you, and possibly an extra pair for a gift??? Hello You ~ So glad you're here.